WSP Consultants India Pvt. Ltd. 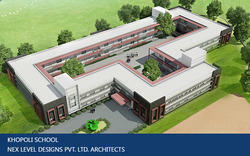 Client p. A. Inamdar education trustarchitect nisar pathan & associatcsr. C. C. Constultant bhilare & associatesanatomy 10 classrooms (capacity 60 students)1 staffroom 1 principals office. 1 games room, 1 store/reoord room cost of project 15lacscompletion period 5 months, june. 1990location vadgaonsheri, pune.